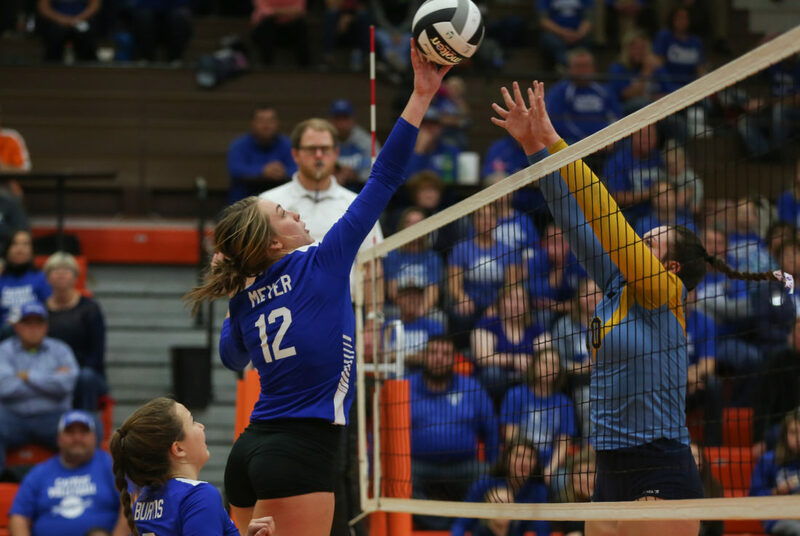 PHOTO BY STEVE WILLIAMS Calvert's Zoe Meyer sends the ball over the net against the defense of an Ayersville player Nov. 1 in Elida during a Division IV regional semifinal match. It will be an unfamiliar feeling for both teams today, but it will be the same one. Calvert and Portsmouth Clay are playing at the state tournament for the first time today in a Division IV semifinal at the Nutter Center on the Campus of Wright State. The match starts at noon with the second semifinal between Monroeville and New Bremen set to begin the other semifinal at 2 p.m. The run for Calvert has been surprising to some, but not to members of the team or first-year coach Lori Rombach. Senior Lexie White said it took a little bit for it to sink in of the history she and her teammates made Saturday, but as soon as she got to look at her phone, it started to. “Definitely after the game Saturday I was feeling super excited and it didn’t seem like it was real because that was the first time in Calvert history,” White said of earning a trip to state. “My Facebook and social media was definitely blowing up, which is awesome. The support the Calvert community has given us has been awesome and even former coaches that I’ve had have shown support. The Senecas navigated their season well with a Sandusky Bay Conference River Division title and just a couple losses with a tough schedule with matches including bigger powerhouses like Norwalk and Holy Name. Playing tough competition and even coming out on top has benefitted them to this point. “There was a point in the season where we went off of the state rankings,” Rombach said. “I called (OHSVCA official) Mary Tarka and asked her if there was mistake or something, and she said there wasn’t so it kind of made me angry. Calvert has a nice mesh of upperclassmen with a few freshmen that contribute. Offensively, the Senecas like to spread the ball around and have hitters all over the court. Ashlyn Jones leads the team with 204 kills, while White has 200 and Zoe Meyer (168), Kate Rombach (147) and Emma White (133) also are contributing. Freshman Emma White leads the Senecas in serving with 61 aces. Jones backs her with 55 and Lexie White had 43. But throughout the tournament, Calvert’s block has been impressive keeping big hitters in check from Mohawk and Leipsic. Meyer has 138 total blocks, while Lila Gehring has 57. Senior Shelby Hemminger leads the team in digs with 373, while Lexie White has 283, Jones adds 281 and Emma White has 209. Emma White also leads the squad in assists with 455, but splitting that duty is senior Sophie Burtis with 360. Despite there being a mix of ages and grade levels on the court for the Senecas, they have stuck together this season and thrived. Coach Rombach added: “I pressed and pressed on these senior leaders to hold each other and the rest of the team accountable and that was hard in the beginning of the season,” she said. “We had some girls not showing up for practice and the older girls didn’t step up and say ‘lets go’. I think to be a great team, we needed to hold each other accountable and they have begun doing that, which makes my job a lot easier. There are some similarities between Calvert and Clay, one being the records with both at 24-3 this season. The other is that it has multiple hitters, but the one to look out for is second-team all-Ohioan Jensen Warnock. Warnock has a team-high 429 kills this season. She also has 50 aces and 267 digs. “We have the same record. We have the same season record and tournament record and its both our first time down there,” Rombach said. “There are so many similarities between us. They have a girl that’s on the all-Ohio team, which is their leading hitter about 400 or so kills and two others that are pretty good as well. To win, the Senecas must keep Warnock in check, but also handle the other hitters the Panthers have, including Delanie Gilliland (284 kills), Taylor Lewis (230) and Jaelyn Warnock (113). Gilliland also has 99 aces and 142 digs, while Jaelyn Warnock has 53 aces, 16 blocks and 238 digs, Lila Brown has 52 aces, 151 digs and 869 assists. Lewis leads the Panthers in blocks with 41. “We know they have a few very solid hitters,” Meyer said. “Obviously, they’re a great team. They’re in the Final 4. No one is getting here by accident, so we’re just gonna work hard and show up ready to play our game. Burtis added: “I’m looking forward to a really good game. But I am looking forward to winning. We want to make history. It’s really important we get our name up on the volleyball poster (in the gym).